Today is Good Friday on the Christian calendar and it is often spoken of as a day of suffering, what with the church celebrating (probably not the best word, maybe remembering?) the crucifixion of Jesus on this day. 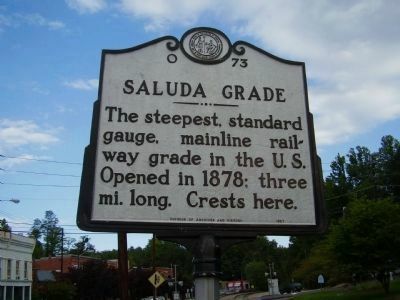 I did my own sort of suffering today riding my bike up Saluda Grade. I did not ride in the railroad bed (I'm a road cyclist not a mountain biker), but I did ride up the rather steep grade with my good friend Brad Holmes. This was my first real day in the "mountains" since I started riding roughly 2 years ago. It was hard, very hard. I maxed out on my heart rate and still had more of the climb left. I sweated profously. My thighs and lower back burned. In a word, I suffered. But I eventually made it to the top. Now this is not the kind of suffering most people think of on Good Friday, but it was how I spent the first few hours of my day, riding my bike, suffering, and loving (almost) every second of it. My suffering, though, brought deep contentment and satisfaction. For a few hours I was able to forget about responsibilities at church, my thesis that is due in 2 weeks, what all I need to do before graduation, etc. I thought about nothing except trying to keep pedaling. I did keep pedaling (except for once when I maxed out my heart rate) and I suffered. This suffering, on top of two precariously thin tires going up the side of a mountain, was my way of experiencing God today on this Good Friday. It indeed made this day good.